"Hot chocolate mixed with peanut butter makes this yummy treat." In a mug, prepare chocolate mix as directed on package. Stir in 1 or 2 teaspoons peanut butter. I didn't try this, but the youngun' made it and she loved it. 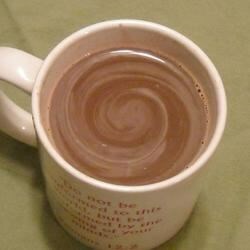 Nothing like waiting until the temp reaches 60 degrees to make a cup of hot chocolate! Thanks Cindy! I loved this! It was great. I do have 2 suggestions though: 1) If you really like peanut butter, 2 teaspoons might not be enough for you. 2) Melt the peanut butter before you put it in. I made this with the I don't care attitude. I had coco and peanut butter so I figured what the hay. I was not expecting to like it. Surprice,surprice it was acually really good. Uh, no. Made this for the boys. They took one drink and refused to drink any more. I tried, just not for us. Maybe if I made a homemade hot cocoa and added peanut butter?